A campaign has been launched to get the documentarian into 10 Downing Street. 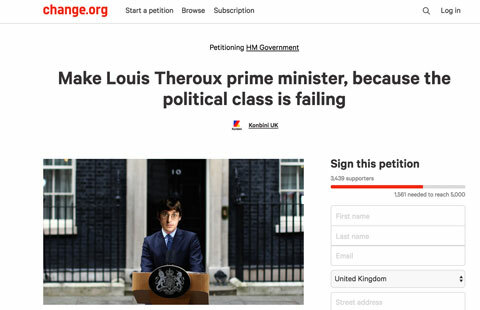 A petition has been launched to make Louis Theroux the next Prime Minister of the UK. The campaign, started by Konbini and featuring on Change.org, calls for the factual film-maker and "national treasure" to take up the highest position in British politics. The website reads: "Since the EU referendum in Britain, politicians, experts and those with the country in their hands have failed to show they are capable of leading the nation during this complex time. "We call on the government to accept that the only right thing to do is appoint presenter, documentary maker and national treasure Louis Theroux as the next prime minister. "As one of the most understanding, smart and trusted men in the UK, Mr Theroux (probably) has more skills to work out what is best for post-Brexit Britain than May, Farage and Corbyn combined. And if he fails, at least he can make a bloody good film about it (or become leader of the opposition and fire some pretty great questions around the Houses of Parliament)." The petition already has 3,439 signatures and counting, which is not too far off its target of 5,000.